World powers announced Tuesday in Vienna that they have reached a nuclear deal with Iran. Indeed, the deal is weaker than the provisional arrangement the White House announced this past April. Under the agreement, which is 159 pages long, the Iranian regime agrees to limit its nuclear enrichment activities for eight years (instead of ten years, as agreed in Lausanne). It will limit its stockpile of enriched uranium to 300 kg, and will limit its research and development, and will be assisted by the international community in some nuclear research, including at the underground facility at Fordow, which it had operated illegally. In return, the international community will drop major financial and economic sanctions against the Iranian regime. The agreement indicates that new sanctions cannot be applied by the EU or the U.S. before a special dispute resolution process is conducted. Crucially, the agreement calls for the UN Security Council to take up sanctions relief “without delay”–even though the U.S. Congress is supposed to have 60 days to review the deal, under a law signed by President Obama this spring. Effectively, the president has agreed to circumvent Congress, such that its power to review the deal is meaningless. In addition, Iranian state television claims, the deal includes provisions to lift an arms embargo against Iran and restrictions on its ballistic missile program, contrary to Obama’s promises in April. In a statement, Obama said that “this deal demonstrates that American diplomacy can bring about real and meaningful change.” He also promised: “I will veto any legislation that prevents the successful implementation of this deal.” He appeared to oversell the deal, claiming that international inspectors will have “24/7 access to Iran’s key nuclear sites,” a provision that applies only to some parts of certain Iranian nuclear facilities. He also claimed that sanctions relief would only come once Iran had completed “key nuclear steps,” again a claim that is only partially true according to the text of the deal. Without a deal, Obama said, there would be no way to stop Iran’s nuclear advancement. Iranian president Hassan Rouhani hailed the deal: “It is possible to solve solution more peacefully when we cooperate,” he said. 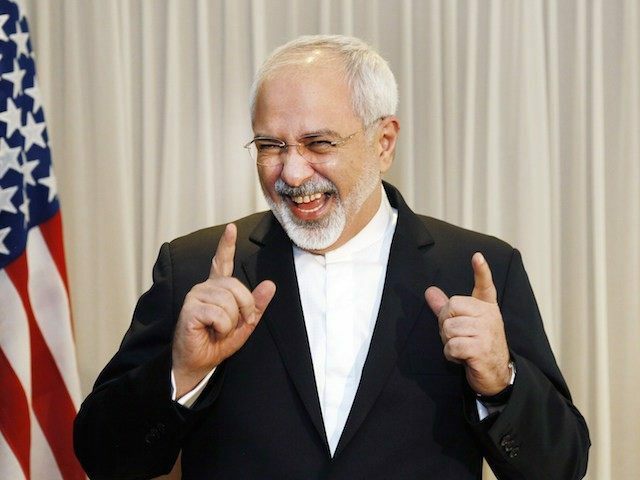 Iranian foreign minister–without a doubt the main winner in the nuclear talks–said that Iran would never develop a nuclear weapon. “[W]hen you are willing to make an agreement at any cost, this is the result,” Netanyahu said. In the U.S., supporters of Israel panned the deal. “The deal will give Iran billions in cash and sanctions relief to fuel its terror and war machines, shred the hard-won sanctions regime beyond repair, and enable the Iranians to get away with hiding the full extent of their nuclear work, infrastructure, and know-how. It will not have an enforceable inspections regime or a workable way to re-impose pressure on Iran when it cheats,” said Josh Block, President and CEO of the Israel Project. On Monday, U.S. Senator Tom Cotton (R-AR) had promised “rebellion” in Congress against the deal, whose terms went far beyond the “red lines” that even the administration itself had established. Other analysts seemed to agree that opponents might muster a two-thirds majority neeeded to override the president’s veto in the likely event that Congress votes its disapproval of the deal. However, it might take effect anyway, since President Obama has cast the deal as an executive agreement rather than a treaty that requires a two-thirds Senate majority to be ratified. The agreement appears to include no provision for the release of Americans held by Iran, including Washington Post reporter Jason Rezaian, who is being tried on widely derided charges of espionage in a closed-door proceeding. Update: Speaker of the House John Boehner has called the deal “unacceptable,” and vowed to stop it. During these negotiations, we outlined five critical requirements for a good deal. We are deeply concerned based on initial reports that this proposed agreement may not meet these requirements, and thereby would fail to block Iran’s path to a nuclear weapon and would further entrench and empower the leading state sponsor of terror. The statement adds that AIPAC will “absorb the details of this deal before reaching a conclusion,” but its decision seems clear.